Ranitidine is known as an H2 blocker. 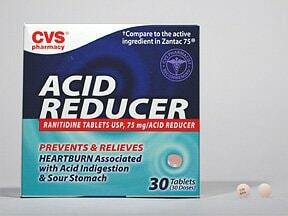 It works by reducing the amount of acid in your stomach. 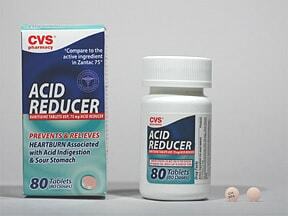 It is used to prevent and treat heartburn and other symptoms caused by too much acid in the stomach (acid indigestion). To treat heartburn and acid indigestion, take 1 tablet with a glass of water as needed, unless otherwise directed by your doctor. Swallow the tablet whole without chewing. Ranitidine can be taken with or without food. To prevent heartburn and acid indigestion, take ranitidine 30-60 minutes before eating food or drinking beverages that can cause indigestion. What conditions does Ranitidine Hcl Tablet treat? Tell your doctor right away if you have any serious side effects, including: vomiting, severe stomach pain, dark urine, yellowing eyes/skin. List Ranitidine Hcl Tablet side effects by likelihood and severity. Before using this medication, tell your doctor or pharmacist your medical history, especially of: a certain blood disorder (porphyria), kidney problems, liver problems, other stomach problems (e.g., tumors). What should I know regarding pregnancy, nursing and administering Ranitidine Hcl Tablet to children or the elderly? Does Ranitidine Hcl Tablet interact with other medications? Different brands of this medication have differentstorage needs. Check the product package for instructions on how to store your brand, or ask your pharmacist. Do not store in the bathroom. Keep all medications away from children and pets. 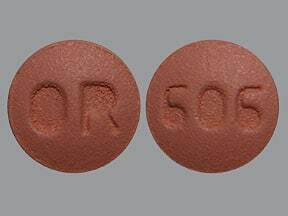 This medicine is a pink, round, tablet imprinted with "OR" and "606". This medicine is a peach, round, tablet imprinted with "OR 606".